Cous cous is a traditionally Middle Eastern dish. It is made of seminola and is cooked by steaming. 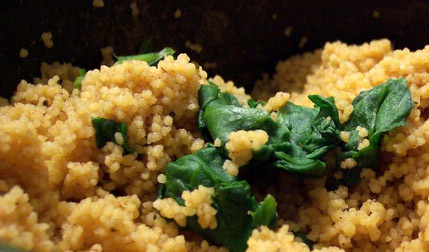 Cous cous has a great texture and is filling and versatile. Even though it’s cooked like a grain, it’s considered a pasta and the size of the balls will vary by style. The ratio of water to cous cous is 2:1. Boil your water first then add cous cous and optional additions. Remove from heat and let stand for 5 mins. Fluff with a fork before serving. Cous cous cooks quickly! It takes five minutes to steam after the water comes to a boil and the cous cous is added. If you’re adding ingredients to your cous cous, cook them ahead of time or make sure they will cook as quickly as the cous cous. Try cous cous with Parmesan cheese, steam it with vegetables like cauliflower or broccoli, add ground beef, herbs and spices or tomatoes. Cous cous will take on the flavor of what you cook it with and will make any meal more filling.